ü This is a natural body mineral and organic constituent. ü These layers are also called soil horizons. ü These layers are with variable thickness. ü The upper layers of soil are called Horizon. ü The bottom layers of soil are called bed rock. ü The main reason for soil formation is weathering. ü After the parent rock is broken the surface water enters into the inter spaces. ü Here the chemical change takes place and chemical substances are produced. ü With the death and decay of plants and bacteria the humus is produced. ü The layers differ from the parent materials in their morphological, physical, chemical, and mineralogical characteristics. ü It is composed of particles of broken rock that have been altered by chemical and environmental processes that include weathering and erosion. ü Soil is continuously interacts with the water, air etc. ü Because of this reason the soil differs from its parent rock. ü It is a mixture of mineral and organic constituents that are in solid, gaseous and aqueous states. ü Soil particles are packed loosely. ü Soil, a renewable resource. ü The soil structure is filled with pore spaces. These pores contain soil solution (Water, petroleum etc) and air. ü Soil is also known as earth. ü Soil is referred to as regolith. ü Regolith means loose rock material. ü Soil contains mineral particles, humus, water, air, living organisms. 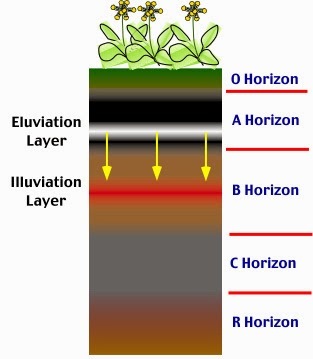 ü Soil profile means the various horizons in the soil. ü Rains affect the minerals in the soil. ü The minerals are carried away by the rain. · The succession of horizons as viewed in the exposed Anatomy of the soil body is called soil profile. · These are the specific layer in the land area that is parallel to the soil surface and possesses physical characteristics which differs from the layers above and below. 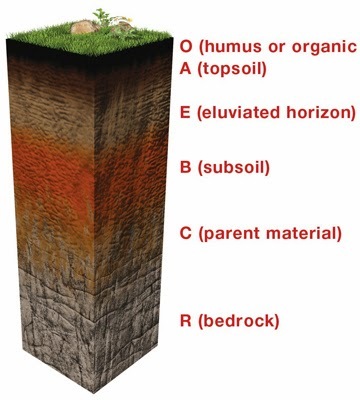 · These Horizons are divided into O-P-A-E-B-C-D-R.
· These are listed from top to bottom with in the soil profile. · All layers are not present in every location. · ‘O’ stand for Organic. · ‘O’ is a surface layer. · This layer is dominated by the presence of large amount of organic material. · ‘P’ stands for peats. · These are formed under water logged conditions. · P horizon is also highly organic. · This is the top layer of the soil. · This is dark in color. · The deeper layer of A-Horizon contains more organic material. · Most of the biological activities occur in A-Horizon. · Many types of warms and bacteria are concentrated here. · A-Horizon is also called bio mantle. · These are present only in the old soils. · These are present between A and B layers. · This layer is largely composed of silicates. · The O-P-A-E layers are collectively referred to as “solum”. 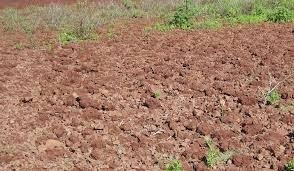 · This is referred to as subsoil. · It consists of Iron and Aluminum. · This layer is also called Zone of accumulation. · This layer contains a very little Humus. · Plant roots penetrate through this layer. · This layer contains largely un weathered rock. · The parent material of the rock is present in this layer. · This is not universally distinguished. · Any soil material below the Solum and other than C-Horizon is referred to as D-Horizon. · This is the bed rock. · This is partially weathered bedrock at the bottom of the soil profile. · This contains continuous presence of rock. ü There are different types of soils on the earth. ü Depending on the content and the color, the soils are classified into various types. ü All soils are not suitable for all types of vegetation. ü This is the reason why all crops are not cultivated in one country or a region. ü This is the most important soil. ü This derived from the word “Alluvium”. ü Suitable for all types of crops. ü The Alluvium contains precious ores such as Platinum and Gold. ü This is suitable for cotton crop. ü This has the capacity to contain high moisture. ü This contains iron and aluminum. Hence the black color. ü This is very sticky when it is wet. ü During summer the black soil develops cracks. ü This is porus and contains soluble salts. 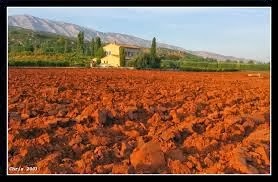 ü Red soil is deficient in Nitrogen, Humus and Phosphorus. ü This is suitable for the cultivation of rice, ragi, tobacco and vegetables. ü Groundnut and potatoes are grown also grown in red soils. ü It contains iron oxides, and impart red colour to the soil. ü This is poor in Humus and Nitrogen. ü This is suitable for ragi, rice with application of manure. ü These soils are soft but harden when exposed to the atmosphere. ü This is deficient in potash, phosphorus. ü These are Rich in Phosphates. ü These soils are Poor in Nitrogen. ü If irrigation is provided they are quite fertile. ü These are also called Reh or kallar or usar. ü These types of soils are usually infertile. ü Salts are present in the upper layers. ü If drainage is provided they would be quite fertile. ü These are highly saline. ü Peaty soils are rich in organic matter. ü These are deficient in phosphorus and potash. ü These are not conducive for cultivation. 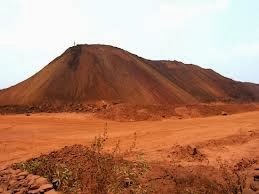 ü The removal of the top layers of the soil is called soil erosion. ü SHEET EROSION: When there is uniform rainfall over the slopes the soil cover is removed. ü RILL EROSION: It occurs after the sheet erosion and the water enters the rock. ü Gully Erosion: It happens with heavy rainfall. Gullies are formed. Soil Conservation is a set of management strategies for prevention of soil being eroded from the earth surface. ü Contour ploughing: This is a farming practice of ploughing across a slope following its elevation contour lines. 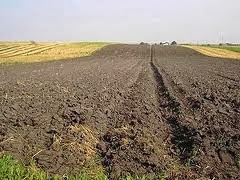 ü Contour Bunding: This is similar to contour ploughing. Stones are placed around the contours of slopes. 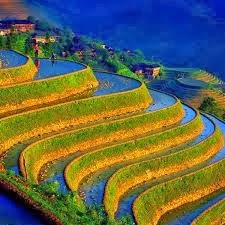 ü Terrace farming: This is also called step farming. 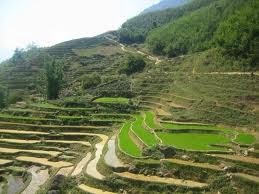 This is used to cultivate the sloped land.Cutting like steps along the hill slopes. It reduces the speed of water. 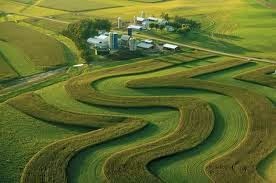 ü Strip cultivation: Cultivation of alternate strips of crops right angle to the prevailing direction of wind. ü Crop rotation: It helps in maintaining the fertility of the soil.